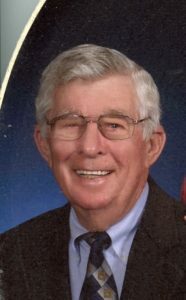 Home Richard O. Broadwell, Jr.
Dicky Broadwell of Selma passed away peacefully on Monday August 27 while in the Smithfield SECU Hospice. Dicky was the son of Richard O. Broadwell, Sr. and Pearl Wilson Broadwell of Selma. He was the last surviving sibling of five: Donnie Broadwell, Jiggs Broadwell, Irma Oliver and Mabel King. He was a loving and devoted husband who was married to Ava Davis Broadwell for 70 years. He was a loving and caring father to his five children. He is survived by his wife Ava, Amy and Neil Taylor of Cary, Joey and Janie Broadwell of Angier, Bart and Kathy Broadwell of Grantham, Jim and Cynthia Broadwell of Clayton and Richard and Mary Broadwell of Sparta. He adored his 9 grandchildren: Hunter Broadwell and his wife Jennifer of Wilmington, Megan Broadwell and husband Andrew of Asheville, Rob Broadwell of Colorado, Jessie and Tim Crooks of Raleigh, Maggie and Neil Kern of Charlotte, Lauren Broadwell of Charlotte, Morgan Broadwell of Angier, Will Broadwell of New York, and Katlyn Broadwell of Rocky Mount. His great grandchildren were very special to him. Ava and Jack Broadwell of Wilmington, Millie Crooks of Raleigh, and Lincoln Kern of Charlotte. Dicky’s family has been in the Selma/ Johnston County area for almost 200 years as farmers, merchants and railroad workers. He was a pillar in his community. Dicky earned the rank of Eagle Scout and shepherded his sons through Scouting. He gave unselfishly of himself to many community and church causes. Dicky served on the Selma Town Council. He was a third-generation member of Selma Baptist Church including a church deacon. He served approximately 40 years on the Selma Volunteer Fire Department. He was a founding member of the Selma Rescue Squad. He coached little league baseball and pee wee football. Dicky’s work career included 37 years of service with Southern Bell and after his retirement he served as a bailiff in the Johnston County Sherriff’s Department. The family will receive friends at Parrish Funeral Home in Selma on Wednesday, August 29, from 1 to 2 pm followed by funeral services at 2:00 PM. Private entombment will be in Selma Memorial Gardens. In lieu of flowers the family wishes any donations would be given to the Smithfield SECU Hospice House.